The guys worked on Saturday this week so the painters that started today would have lots of rooms where the floor was finished. Usually, paint happens near the end of the job, but this one’s schedule had us doubling up on the trades. The hallway and laundry room got finished, which are not very exciting pictures, so I forgot to even snap them. 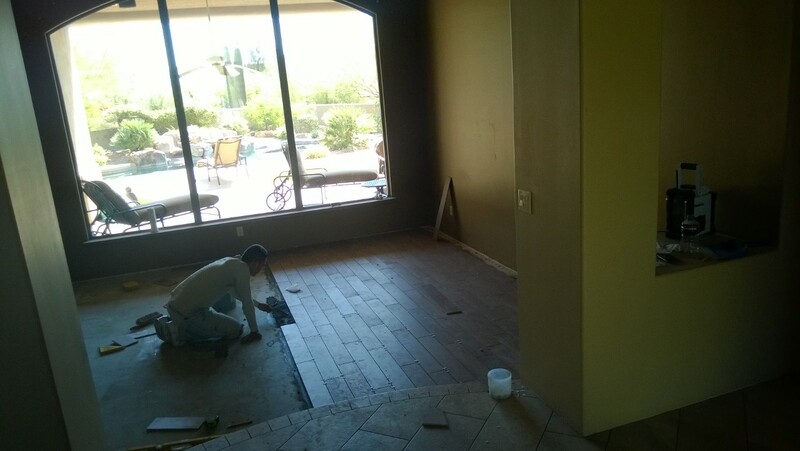 The formal living room is getting a porcelain tile that looks like wood with a random placed grout line. Since the foyer and hall tiles are on the diagonal, we chose to lay this one from front to back with a random grout joint to emulate the way wood floors are installed. 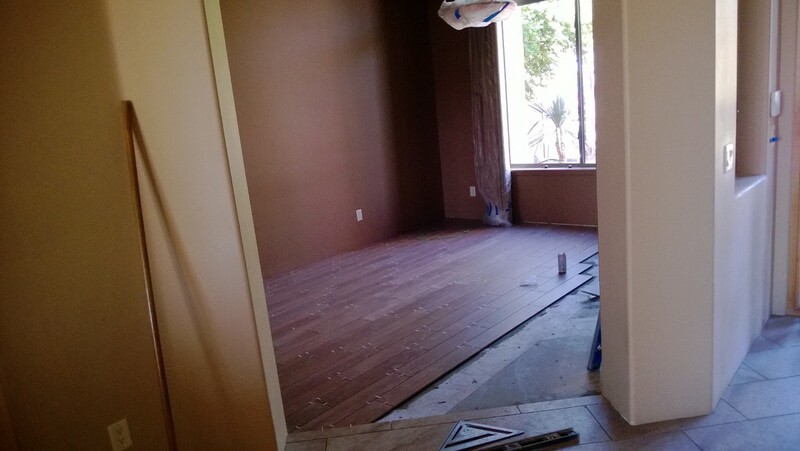 The dining room is just to the right of the entry way and the office is just to the left, so we opted to use the same flooring as the formal living room so they would be all tied together. The crew also red-guarded the steam shower, which I did not take a picture of yet as they were putting on a second coat and it was so pungent that I couldn’t breath in there. I’ll get it tomorrow, hopefully before they get too many tiles on the walls. Love the wood look tile and how it plays off the foyer/hall tile. Looks awesome! Thanks, Lainey! It’s really coming along! I’m excited to see fresh paint on the walls next.